"My, you keep the strangest things in your bra." More madness ensues in disc number five of the Urusei Yatsura series, which features another eight, half episode installments in this bizarre alien comedy. Like the previous three installments, the cast find themselves faced with a barrage of strange situations and characters, and you can't take anything for granted. Ancillary parts are expanded, with a pair of episodes centering around the richest boy in school, Mendou, who even has his own private army. Like his fellow classmates, Mendou is in love with Lum, and can't understand what she sees in the impossible Ataru Moroboshi. We also see the arrival of one of Lum's old school friends. The first misadventure is picture perfect... almost. When Mendou brings his family's camera to school, it creates more headaches for young Mr. Moroboshi. It seems whenever a snapshot is taken, its subject is thrown into another dimension. Of course, women of all ages are a target for Ataru, which means Lum has some cross dimensional retribution to deliver. Next, Ataru's exercise routine, which is highlighted by several "scenic" locations, has some unexpected consequences. It seems he has summoned another demon, and will have to figure a way out of another hairy situation. Lum is surprised when her best childhood friend pays a visit, but Ran isn't quite the sweet young girl she seems. Ataru is after her in an instant, which inspires Ran's next bit of scheming—it seems she holds quite a grudge against Lum, and is out to exact revenge! Far be it for Ataru to turn down a date, especially when the girl in question is his new found love, Ran. Lum isn't about to put up with his shenanigans, especially when she finds out what Ran is really up to. Ataru will be beside himself when he figures out what's going on in this crazy episode. A diary holds the key to the future, and when Ataru gets his hands on it, look out! There's only one person who can fix this fine time-warping mess, and it isn't going to be pretty! If you hadn't guessed already, this is one truly insane show, full of fun, but quirky, characters and over-the-top humor. With each 15 minute installment being pretty much self-contained, the show is great for quick watches at the end of the evening. The cast keeps growing disc by disc, adding more potential for wackiness. With the next disc rounding out the first series, the major players are on deck for the next stage in this goofy comedy. Image Transfer Review: Image quality is pretty consistent with the previous discs. Colors are strong, though reds tend to bleed a bit, and blues can sometimes be grainy. There is some rainbowing in the last episode. Print defects are minor. For a near twenty-year-old show, this looks pretty decent. Audio Transfer Review: Aside from a bit of hiss and brashness on some voices, the mono Japanese soundtrack is delivered pretty well. While not exactly full range, the sound isn't tinny, and there are no major defects to call attention to. AnimEigo's patented liner notes accompany the release with more behind-the-scenes and cultural tidbits. I wish more anime companies included these. 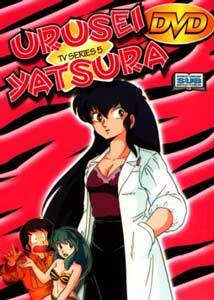 With a couple of real standouts here, disc five makes another welcome addition to the Urusei Yatsura library. The series manages a consistent level of humor, and a diverse range of situations. This is prime, old school anime, and deserves its classic status.